CO2 wellheads in the Rocky Mountain region. Image: Denbury Resources Inc. When governments get out of the way, remarkable things can happen. For example, some industry pundits now say that it is perfectly possible that the USA could become substantially self-sufficient in energy, with huge resources of coal, abundant gas and a transformed oil sector, the latter two being driven by the adroit use of technology. Many aspects that are now common place – ‘tight’ gas, coal bed methane, shale gas, shale oil, deepwater oil, EOR using CO2 – were once regarded as ‘unconventional’, new, full of risk. Indeed, in the next edition of GEO ExPro, I will argue that we should drop the term ‘unconventional’ and simply recognise that, with the appropriate technology, we can extract reservoired hydrocarbons from wherever they may be found. But this applies to the USA (and Canada) where the efforts made by, and the technology available to, the oil and gas industry are truly staggering. What about Europe and in particular the UK? How CO2-enabled EOR works. Source: www.EnhancedOilRecovery.com At the European level, what passes for energy policy seems to be focussed on mitigating the conjectured threats of climate change rather than establishing how exactly we Europeans are going to keep warm, cooking, moving around and running our industries for the next 50 years. There seems (to me) to be a lot of wishful thinking about the impact of renewables (praiseworthy but marginal) and in so far as a continuing dependence on fossil fuels is acknowledged, an acquiescence to an increasing dependence on imports of coal, gas and oil. The economic, political and security benefits of increasing self-sufficiency do not seem to resonate as they do in the USA. Because the climate debate has gained so much traction in Europe, it is pretty clear that there will be an increasing focus on gas, the cleanest of our fossil fuels, and we can already see some of the Majors, for example Shell, having at least 50% of its production being gas from now on. But what other levers are there? I want to link two here. 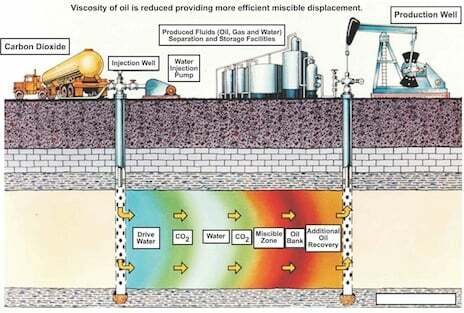 Secondly, enhanced oil recovery (EOR) utilising CO2 is said to be the most efficient and effective of the improved recovery mechanisms available to us, in comparison to others like steam flood, the use of chemicals, water-alternating-gas and microbials. Opportunities for CO2-enabled EOR in the UK? EOR candidates are accessible from proposed CCS projects The UK has a unique position and opportunity – at the moment – because it has a vibrant offshore oil and gas industry adjacent to on-going and planned coal-fired electricity generation. This opportunity was the theme of a Finding Petroleum Forum in London recently, with presentations from 2CO Energy, CO2 Deep Store, the University of Durham and Altona Energy. What is the opportunity? Consider the US analogue first. EOR based on CO2 is very common, even commonplace. Technical ‘know-how’ exists in the oil and gas companies, not only in the Majors but in companies of all sizes. Subsurface assets are available. Some 50 million tonnes of CO2 is injected annually, in miscible and immiscible floods, generating 350-400 Mbopd, or some 5% of US production, with some 1 billion ‘extra’ barrels recovered to date. Increases in STOIIP recovery factors are in the range 4-12%; some would estimate ‘extra’ reserves to be as much as 240 billion barrels. Much CO2 is recycled but it is estimated that 1/3 tonne of ‘new’ CO2 is needed per produced barrel of oil; thus a lot of CO2 is needed. So far, CO2-based EOR has been applied to relatively low quality, shallow and therefore cool, reservoirs, but significantly better reservoirs are available in the Gulf Coast and offshore. The UKCS has these higher quality deep reservoirs. Again the technical knowledge is available, more concentrated perhaps in larger companies than in the U.S. Also, there is some experience of moving conventional gas around the North Sea, for example from the Schiehallion field to the Magnus field, in the Miller area, and in Morecambe Bay. Although EOR based on CO2 is untested in the UK, with mainly miscible floods one could anticipate an average increase in STOIIP recovery factors of 5% or more, corresponding to at least 3 billion barrels of ‘extra’ reserves. 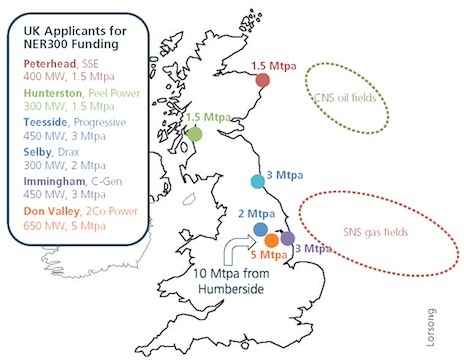 As a first step, pilot carbon capture and storage (CCS) projects in the UK could supply between 5 and 11 million tonnes per annum of gas (probably via Humberside) to UKCS Central North Sea fields, by 2020. A field with circa 800-1,500 MMb STOIIP could consume around 80 million tonnes of CO2 in 20 years and deliver 120-240 Mbo ‘extra’ reserves. 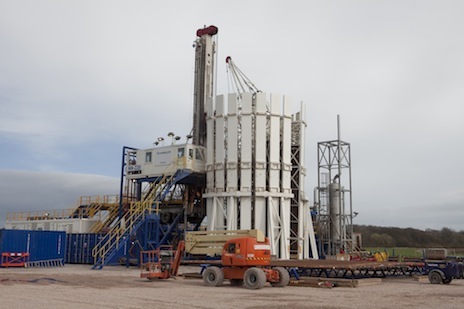 Cuadrilla Resources drilling for shale gas in north-west England. Image: Cuadrilla Resources What is the cost base for a complete project, involving a new power station supplying CO2 to an existing field? The numbers are quite large: about £1.5 billion for a power station plus another £0.5 billion for CO2 capture, plus £1 billion for a pipeline, plus another £1 billion for modification of the existing field. The total of about £4 billion quickly puts such projects into the realm of needing a Major’s balance sheet as well as its financial expertise, and requiring close cooperation between such a Major and a power company. Is any of this likely to be economic? A good place to start is to say that at current and foreseen gas prices, a ‘clean’ coal-fired power station, with CCS fitted, is significantly less attractive economically than a combined cycle gas-fired power station, and this seems likely to be so no matter what governments may do about carbon prices. Thus using CO2 for EOR delivers an extra, potentially highly lucrative, revenue stream that may outweigh the extra costs of implementation, in particular the costs of upgrading existing oil production facilities, improving pipeline protection against corrosion (CO2 and water is an especially aggressive mixture) and so on. Also, and very importantly, the utilisation of CO2 for EOR and then storage at the same site pushes out, perhaps for decades, the moment for decommissioning and its associated costs. So the economic modelling for an onshore-to-offshore CO2-enabled EOR investment is relatively sophisticated, and critically dependent on an assessment of the risks involved. As I have indicated, the technology, the technical knowledge, the favourable rocks and the finances all exist in the UK and for its offshore area. The main issue, the main stumbling block, is getting such a project moving when there are potentially so many players – the Majors, big power companies, the UK Government (the Treasury on the one hand and DECC on the other), local government and local communities. The key may be for the UK Government to provide short term funding, perhaps a tax-based incentive, anticipating a future tax stream from increased UKCS oil production. A Durham University study found that CO2 captured through CCS and used for EOR could lead to £150 billion of ‘extra’ oil revenue from existing oil fields in the UKCS North Sea, oil that would not otherwise have been produced. This would be of significant economic value to the UK, as it would add around £60 billion in revenue to the UK Treasury, as well as also having tangible political benefits, moving in the direction of energy self-sufficiency once more. Stepping right back, the European response to these issues is incoherent and there is a risk that the Majors who know how to do these things will walk away and focus on projects that are more completely under their control. In this context we can understand Shell’s decision to continue building global CCS capacities with a number of demonstration/research and industrial scale projects worldwide but to concentrate on those where it is in sufficient control to mitigate risks, can find supportive governments, and focus on driving unit CCS costs down. A good example is its >1 million tonne CO2 per annum CCS project in Alberta, in connection with its oil shale mining, with regulatory and financial support from the governments of Alberta and Canada. Perhaps this is a model for how things might work in the UK? There should be a sense of emergency. This opportunity exists at the moment but the other side of the decommissioning coin is that the age of abandonment in the UKCS is almost upon us – too much dilly-dallying and the existing infrastructure will have all but disappeared. As global exploration gets more difficult, there is a major prize to be gained by increasing flow rates and improving recovery factors in existing fields. In any petroleum province which is very mature in exploration terms, such as the North Sea, it would be better for companies to stop ‘wildcat’ exploring and focus on enhancing production in and around existing oil and gas fields. For the UKCS’s oil fields, CO2-enabled EOR will be a key tool. It should be emphasised that increasing recovery factors depends on a range of technologies – surveillance and ‘smart’ wells as well as EOR. Nevertheless, worldwide, just a 1% increase in the global average recovery factor represents almost 90 Bbo, equivalent to replacing roughly 3 years of production at current levels: expertise developed in the UK, for the UKCS, would be marketable worldwide.